For a tour of the Sweet Briar College Campus, click here. To see a model that predicts the location of archaeological sites in Amherst, click here. 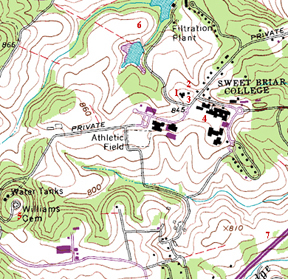 For an historic tour, read below for sites that still stand on the Sweet Briar College campus. 1. Sweet Briar House (originally the Locust Ridge Farm, circa 1790. Elijah named it Sweet Briar in the 1840s and added on to the original building in the early 1850s). 2. Slave Cabin (there is no dot for it, but it lies north of #3). Built circa 1850s. Originally there were several wooden houses behind Sweet Briar house which were lived in by the enslaved African Americans. 3. Garden Cottage, oldest standing property, circa late 18th-century. Sidney Fletcher used it as a farm office during the mid-19th century. Site of the Slave Cemetery, circa 1960s when the spot was still clearly delineated by a ring of trees.